Nunavik Inuit and other Indigenous groups in northern Quebec have sounded the alarm over the rapid decline of the Leaf River caribou herd and they’re urging the Quebec government to put an immediate end to its sports hunt. A survey, conducted by Quebec government biologists this past summer and presented to a wildlife committee last week, estimates that the Leaf River herd, numbered at 430,000 animals in 2011, has dwindled to a population of about 199,000. A drop of more than half of the herd’s numbers is troubling, but Indigenous groups in northern Quebec say they’re even more concerned that the province plans to continue handing out sports hunt permits. Delisle Alaku sits as a representative on the Hunting Fishing and Trapping Coordinating Committee, the body that oversees harvesting rights under the James Bay and Northern Quebec Agreement. While Indigenous membership of that group, including James Bay Cree and the Naskapi, have called for an immediate closure of the sports hunt, Quebec has not made public its approach to the herd’s drastic decline. Quebec’s department of Forests, Wildlife and Parks did not return Nunatsiaq News’ request for information by press time. But any delay in cancelling the sports hunt would be to “the detriment of our food security,” Delisle Alaku said. Despite repeated calls for a closure, province took more than more than three years to close the sports hunt for the George River herd, Makivik says. That’s after the herd, which once numbered more than 760,000 caribou, shrank to 8,900 animals, a 2015 survey estimated. “We do not want history repeating itself and lack of decision on the part of government causing the Leaf River herd to crash the way of the George River herd,” he said. 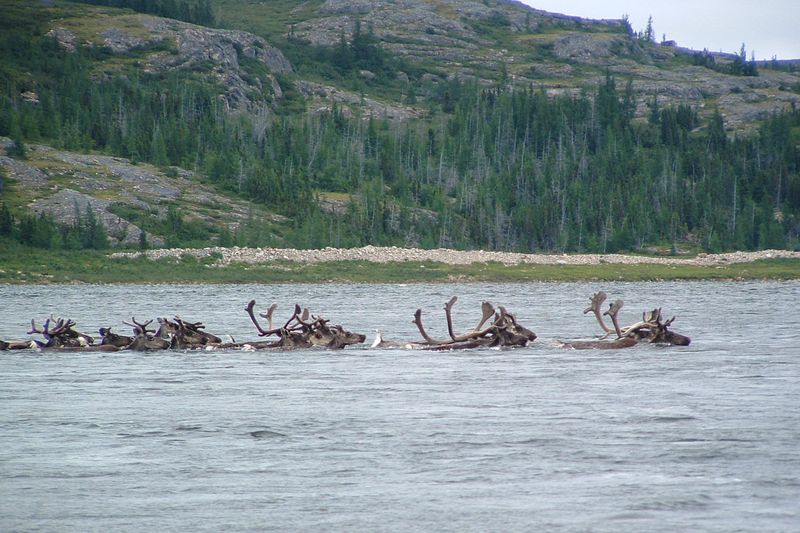 The Leaf River herd typically travels up Nunavik’s coasts in the summer months. However, while visiting his hometown of Salluit last summer, Delisle Alaku said the herd he used to see covering the hillside outside the community was there in much smaller, scattered numbers. “We’re seeing less caribou and it’s quite alarming,” he said. Science and traditional knowledge alike have noted the cyclical nature of the caribou population, suggesting the population will recover in time. But Inuit must consider new factors, Delise Alaku said: the impacts of climate change on the population’s health, including new parasites and predators, along with an increase in air traffic and a larger human population. The 2016 Quebec survey found a general decline in the animals’ physical health, likely due to a deterioration of their habitat and predation by wolves and black bears. In this case, Inuit don’t question the survey’s scientific findings. From a combined total of more than 1.2 million animals from both the George River and Leaf River herds in the 1990s, Makivik says the caribou populations in Nunavik have all but disappeared. In 2011, Quebec announced a 25 percent cut to the number of permits handed out to hunters for the Leaf Bay herd in Nunavik and lowered the caribou quota to two per hunter. But it’s not clear what numbers of caribou were allotted to the sports hunt in Nunavik since then. “It is now squarely in Quebec (Forests, wildlife and parks) Minister Luc Blanchette’s court to do the right thing—close the sports hunt!” Makivik said in a Dec. 19 release.